Here’s a quick way to decorate for your next camp themed event or just add the cozy touch of a campfire without any of the mess, maintenance, or headache. This faux campfire is pretty darn convincing copy of a campfire burning low with reddish orange embers, but you won’t have to worry about any of the typical fire-pit concerns like calculating safe distances, overheating guests, or watching young guests with an eagle eye- even better- you can even set it up indoors! With no smoke and no real file, this faux campfire decoration takes just a a few minutes and guarantees “wow’s” from your guests. A real firepit, metal washtub, or other vessel for your “fire”. Orange Flickering String Lights available from Amazon or occasionally at Halloween or Christmas specialty stores. Real Sticks or Small Logs (remember the effect is light shinking through the wood, so don’t use pieces that are too large or layer them thickly) Use half-burned logs from a real campfire for an even more realistic effect. Locate your pit or bucket where you want your campfire and consider your power supply. If you are plugging your lights into a wall outlet, place your pit within cord reach of an outlet. For use beyond the reach of an extension cord or to eliminate the hassle of taping down electrical cords so they don’t trip guests, you can also use a portable AC power source, tucked in the bottom of your fake campfire, to eliminate the need for a cord extending to an outlet. 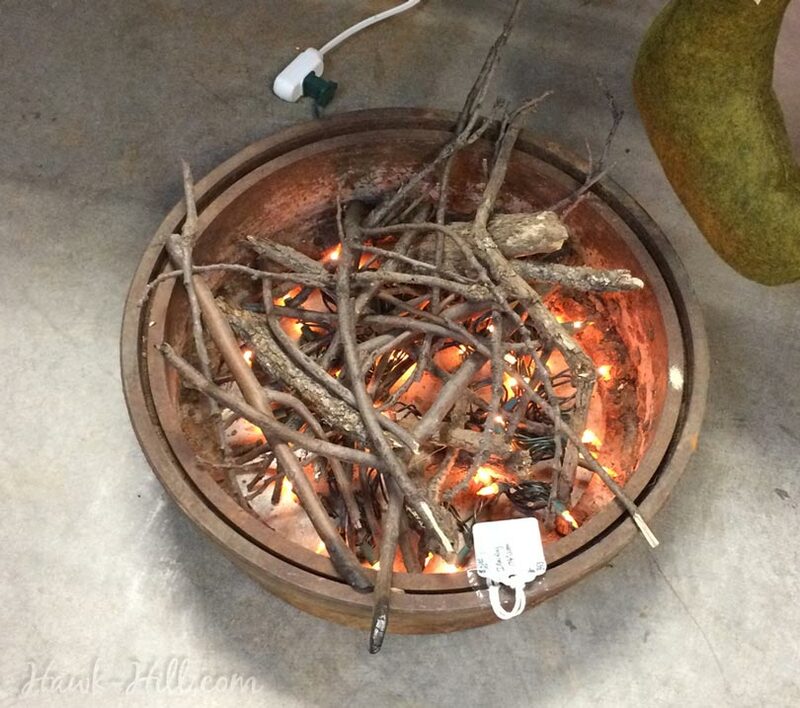 Next, place the orange flickering lights in the bottom of your firepit or bucket. You’ll want to spread them out across the bottom of the pit to create a more realistic look. The third and final step is arranging the sticks or logs over the orange flickering “campfire” lights. This is where you’ll want to slow down and be intentional about your arrangement. You’ll want to use enough sticks to partially conceal the fact that your flames aren’t actual flames, but allow enough light through that it looks like a real campfire glowing with hot embers. This method works great for constructing a “fire” for kids parties, such as camp themed parties or pirate themed parties. By tweaking this tutorial just a little, you can create charming seasonal accents for Christmas or spooky witch’s cauldron-heating fires for Halloween haunted houses.